Map courtesy North Tree Fire and U.S.G.S. EVACUATIONS - Mandatory evacuations lifted that were in effect for the areas of Ormsby Cutoff and Highland Way. About 85 structures are threatened. Road Closures: Maymens Flat Rd, Highland Way, Ormsby Cut, Loma Prieta, Mt. Madonna, Spanish Ranch. SKY/WEATHER.........PARTLY CLOUDY. PATCHY FOG IN THE MORNING. 24 HR TREND......4 DEGREES COOLER. VALLEYS/SLOPE....NORTHWEST WINDS 5 TO 10 MPH. LOCAL GUSTS TO 30 MPH. LOWS IN THE MID 40S TO LOWER 50S. IN THE 50S TO UPPER 60S. 5 MPH. LOWS IN THE 40S. HIGHS IN THE 50S TO UPPER 60S. Update: 07214 10-27 - 485 acres. 75% - SCU Cal Fire Battalion Chief Darrell Wolf admits possibility that CDF started the #LomaFire. Update: 0714 10-26 NOPS GACC - The Loma Incident, CA-SCU, is 600 acres with 20 percent containment. This fire is under the command of Morris' Type 1 Team, with over thirty years of firefighting experience Chief George Morris Jr. has commanded some of the state’s largest and most complex emergencies. Update: 1130 hours - 800 acres, CAL Fire Team 3 (Morris) to transition this evening at 2000 hours. Fixed wing still grounded (1130 hours), wind has increased to steady 20 with gusts to 50. 10 to 12 Golf ST requested. Update: 1100hrs ICP currently being set up at Santa Cruz County Fair Grounds. 0630 local Command and Operations agreed that this fire will need a command team for logistic reasons, They are anticipating 4-5 days. Update: 0900hrs 600+ acres, CAL FIRE Team 3 (Morris) is ordered. Aircraft resuming flights. Still fairly strong north winds at 30 MPH. Update: 0800hrs - 400 acres, Mandatory evacuations were in effect for the areas of Ormsby Cutoff and Highland Way. About 85 structures are threatened, she said. Update: 0700hrs - 300+ acres, *Evacuations* - Hundreds being evacuated this morning due to a wildfire burning in the Santa Cruz Mnt. area. Temporary Flight Restriction in effect for media aircraft over the fire. Update: 0500hrs - 100+ acres, high winds, heavy fuels. Update: 0330hrs - Summit IC - 5ac mod rate of spread, Fire has now burned thru a canyon burning up the other side of the canyon. requesting a full wildland response Loma Prieta Wy x. Summit Rd./Mt. Staging at Burrell Station on Summit Rd. Resources: Large resource orders, dozers, and crews. [EDIS] *High Surf Advisory* Central California Coast - Remains in effect until 11 pm pdt this evening. Description: A LONG PERIOD HIGH ENERGY NORTHWEST SWELL TRAIN IS FORECAST TO IMPACT THE CENTRAL CALIFORNIA COASTLINE EARLY THURSDAY MORNING TO THURSDAY NIGHT. A LONG PERIOD HIGH ENERGY NORTHWEST SWELL WILL ARRIVE AT THE CENTRAL CALIFORNIA COASTLINE TODAY AND PRODUCE DANGEROUS BREAKING WAVES WITH HEIGHTS AS HIGH AS 13 TO 16 FEET. THESE WAVES WILL CAUSE HAZARDOUS CONDITIONS NEAR THE SHORE THROUGH LATE TONIGHT. SURFERS AND BEACH GOERS SHOULD BE EXTRA CAUTIOUS NEAR THE SHORELINE AS THESE WAVES ARE EXPECTED TO BE RELATIVELY STRONG AND CAPABLE OF GENERATING STRONG LOCALIZED RIP CURRENTS. A HIGH SURF ADVISORY MEANS THAT HIGH SURF WILL AFFECT BEACHES IN THE ADVISORY AREA...PRODUCING RIP CURRENTS AND LOCALIZED BEACH EROSION. Wilder Ranch State Park began a series of "vegetation management burns" on Monday that will continue for two weeks. When: Burning will take place on various days during the next two weeks depending on weather conditions, available resources and local fire activity. Closures: Some trails in the park may be closed briefly during the burns. Smoke: Heavy smoke from the controlled burns at Wilder Ranch State Park drifted through Scotts Valley yesterday. Why: Controlled burns are one of the tools used to help maintain habitats and reduce of fire hazards. For more information: California State Parks Department - 335-6318. 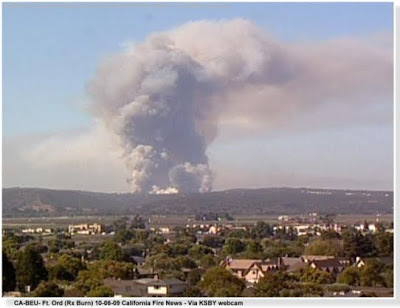 Today in San Diego History - 2007 Firestorm: The Rice, Harris Fire, Witch, and Guejito fires burned northwest from near the border into San Diego, Burnig 350,000 acres and leaving in it's wake 10 people Dead, 350,000 acres and nearly 500,000+ people evacuated. and more than 1,300 homes were destroyed by the fires. A Sierra Conservation Center inmate who escaped from prison in July 2008 and set fire to a landmark home in Jamestown faces up to eight additional years in prison after he pleaded guilty Monday to arson and escape. George Landecho Lopez, 36, entered his plea as part of an agreement with the Tuolumne County District Attorney’s Office. Under the deal, Lopez faces up to eight years for escaping from custody by force and arson of an inhabited structure, Deputy District Attorney John Hansen said. Lopez will also have to register as an arsonist. The DA dropped three other counts —first degree residential burglary, burglary and receiving stolen property, as part of the agreement. He could have faced nine years and eight months in prison if found guilty on all charges, according to Hansen. Lopez will be sentenced at 1:30 p.m. Nov. 16 in Department 1 of the Tuolumne County Superior Court. Lopez was slated for trial Oct. 28. He pleaded not guilty at his first arraignment July 31 but had the option to change his plea Aug. 31, or take an eight-year cap deal offered by the District Attorney’s Office. However, on Aug. 31 Lopez maintained that he was not guilty and a trial was scheduled. The fire also destroyed a vast collection of antiques in the home at the time, appraised at about $500,000, homeowner Kari Faughnan has said. Lopez was captured July 22, 2008. He was found hiding in a vacant firehouse in Chinese Camp. He was found with jewelry and an antique gun belonging to Faughnan, and wearing clothing taken from her home, court documents said. Lopez has prior convictions in Imperial County for possession of marijuana for sale, and in Tehama County for being a felon in possession of a firearm, failing to appear while on bail, and evading an officer, court documents said. Faughnan and her estranged husband, Steven Faughnan, sued Sierra Conservation Center Aug. 26 in the Tuolumne County Superior Court seeking $2 million in damages. The suit claims SCC was obligated to search the area surrounding the prison for 72 hours but called the search off after only 24 hours. The suit further alleges the Faughnan home is included in a checklist of mandatory homes surrounding the prison to be searched, but it was not. Kari Faughnan said Monday she was happy Lopez pleaded guilty so she can begin to move on. “The one thing I keep saying, you could build me 10 houses, you can’t give me back what was lost in the fire. It wasn’t replaceable,” Faughnan said, adding that both she and her son have seen a counselor since the fire. Faughnan said many community members reached out to her family and that sheriff’s and fire investigators were exceptionally supportive. 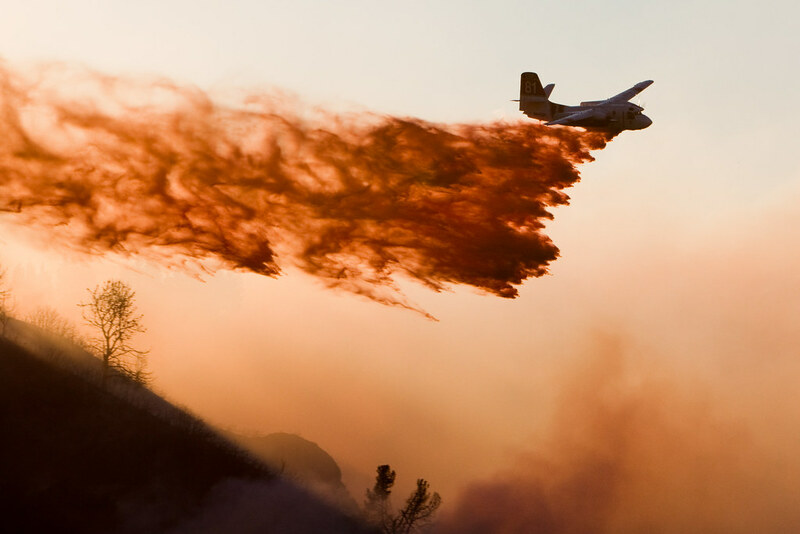 A San Bernardino County grand jury indicted Rickie Fowler on five counts of murder in connection with a 2003 wildfire that resulted in the deaths of six people in the path of the blaze, The Los Angeles Times reported. If convicted Fowler could face the death penalty, prosecutors said. The investigation as been ongoing since the first day, but gained steam last year, and then new evidence surfaced a few weeks ago. Prosecutors had until Sunday to file arson charges – that’s when the statute of limitations would have run out. Fowler has been jailed since 2003 on robbery charges, district attorney Michael Ramos said. Several witnesses told authorities ahead of the blaze that they saw a man they believed was tossing lit matches out of his truck in the area. Investigators say Rickie Fowler and another man were seen driving a white van along the road where the “Old Fire” began, and one of them threw a road flare into dry brush. The man Fowler allegedly was with that day was shot and killed three years ago. The fire burned 90,000 acres, destroyed a thousand homes near two mountain resorts, and led to the heart attack deaths of five people, the youngest of whom was 54. Because the deaths occurred as a result of arson, Fowler could face the death penalty, if he’s convicted. He’s currently serving time for an unrelated burglary conviction. A minor earthquake occurred at 6:17:16 AM (PDT) on Wednesday, October 21, 2009. The magnitude 3.3 event occurred 8 km (5 miles) W of Mt. San Gorgonio, CA. On July 21, 2009 Thomas Marovich, 20, of Hayward California incurred fatal injuries when he fell while performing routine rappel proficiency skill training at the Backbone fire Helibase in Willow Creek, California. As reported at California Fire News National Forest Service Firefighter Thomas Marovich, 20, had been taking part in required weekly rappelling training, in which people slide down a rope from a hovering helicopter when he fell about 200 feet to the ground, said Forest Service spokeswoman Robin Cole. FF. Marovich was a second year apprentice firefighter on the Modoc National Forest, she said. He was working with the Chester Helitack Crew from the Lassen National Forest that had been assigned to the Backbone Fire in the Trinity Alps Wilderness. The training was a routine part of the ongoing battle to contain the Backbone Fire, a Forest Service spokesman said. The training is conducted at least every 14 days, he said. The death is being investigated by a Forest Service accident investigation team and the National Transportation Safety Board. Now the United States Forest Service(USFS) is in a fight with the Occupational Health and Safety Administration(OSHA) involving the release of the Backbone accident investigation documents. 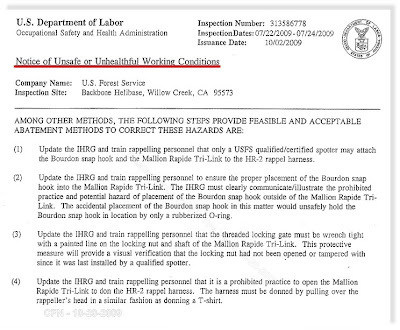 USFS Charged with "Willful" violation of the Occupational Safety and Health Act. OSHA accuses the USFS failing to provide requested information about the accident. USFS continues to refuse to release documents related to the incident, and responds in writing that they would continue to not comply with OSHA's request. 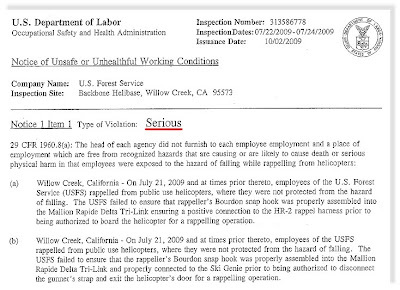 USFS Charged with "Serious" violation of the Occupational Safety and Health Act. The serious violations involving the unsafe methods and procedures for the use of the rappel equipment, was an somewhat expected development as problems were identified early after the fact with the securing of specific rappelling equipment. A minor earthquake occurred at 8:47:29 AM (PDT) on Sunday, October 18, 2009. The magnitude 3.3 event occurred 7 km (4 miles) S of Spring Garden, CA. A minor earthquake occurred at 9:53:44 PM (PDT) on Friday, October 16, 2009. The magnitude 3.2 event occurred 6 km (4 miles) ESE of Oxnard, CA. Burn ban lifted in numerous CAL FIRE Units, National Forests and Bureau of Land Management lands. Fire season has ended in North Central California. TCU - Touloumne Calaveras Unit has lifted the suspension of burning on private lands. The unit includes Tuolumne and Calaveras counties in addition to eastern portions of Stanislaus and San Joaquin counties. Burning is prohibited during high winds. Burn pile sizes must be a maximum of four-feet in diameter, all flammable material and vegetation within 10 feet of the outer edge of the pile must be cleared. Water supply must be close to the burn site. The person conducting the burn must also stay there with a shovel handy until the fire is out. The burning of trash, tires and plastic is prohibited. Cal Fire officials say to also avoid burning piles of pine needles as they smolder and often spread dense smoke. "Even though the danger of large and damaging wild land fires has diminished, a fire can still escape,” said Mike Noonan, fire chief of the Tuolumne-Calaveras Unit. “It is critical that the person conducting the burn keep close watch on the fire at all times. If the fire gets away, that person can be held liable for the damage and suppression costs. MNU - Cal Fire's Mendocino Unit has declared that the 2009 burning suspension and fire season will end at 8 a.m. Friday. Cal Fire, in conjunction with the Mendocino County Fire Chief's Association and the Mendocino County Air Quality Management District, also rolls back a countywide suspension for door yard and large pile burning, Cal Fire stated. BTU - Butte - A ban on residential burning will be lifted at 8 a.m. on Monday, Cal Fire-Butte County officials have announced. Burning is not permitted inside the Chico city limits at any time. Residents in the unincorporated areas of Butte County may burn without a permit until May 1, 2010, when permits will again be required. Not all days are burn days, however, and residents must call the Butte County Air Quality Management District before burning at 896-2537 to check the status. 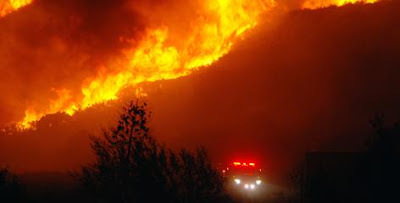 Cal Fire will not require burn permits again until May 1, 2010. MNF - Mendocino National Forest: As of Wednesday, fire restrictions in Mendocino National Forest were lifted due to rain and lower temperatures. Those with a valid California Campfire Permit can have fires outside of designated campgrounds, including wilderness areas, Mendocino National Forest stated. YNP - Yosemite National Park - Yosemite National Park announces the end of the fire season, October 16th, 2009. Yosemite National Park experienced measurable precipitation earlier this week. The rainfall measurement, from park weather stations, varied from 9 inches of rain in the Mariposa Grove, to approximately 8 inches of rain in Wawona, to 5.5 inches of rain in Yosemite Valley. Measurable snow also fell at higher elevations. Closure of the fire season occurs when there is a season ending precipitation event totaling 2 inches or more. Historically, there is a 90% chance that Yosemite will have a season ending weather event by October 31. Helicopter 551, Yosemite’s helicopter that is contracted for the fire season, has now left the park. Additionally, seasonal fire personnel are completing their assignments and will soon also be leaving the park. Clear flammable material for a minimum of five feet in all directions. Have a responsible person in attendance. Extinguish the campfire with water, stirring the coals and ash, and feeling for heat or warm spots and continue until coals and ash are cold. Campfire permits are available free at any Forest Service, Bureau of Land Management of Cal Fire office. To remain compliant with regulations, only clean, dry vegetative waste such as leaves, pine needles and yard clippings may be burned. Burning should be avoided on windy days, and debris piles should be no larger than four feet in diameter. For more Cal Fire information: Cal Fire's web site at www.fire.ca.gov. A minor earthquake occurred at 3:03:39 AM (PDT) on Friday, October 16, 2009. The magnitude 3.5 event occurred 6 km (4 miles) NNE of Beaumont, CA. At 10:15 a.m. on October 15, 2009, millions of Californians will participate in the largest earthquake drill ever! Everyone can participate! Use the map and links below to learn how.Participating Stations that will play one of the ShakeOut Drill Broadcasts at 10:15 a.m. on October 15. All radio and television stations in California are urged to participate by playing one of the audio or video drill broadcasts. A minor earthquake occurred at 8:27:41 PM (PDT) on Tuesday, October 13, 2009. The magnitude 3.7 event occurred 3 km (2 miles) NNE of Sunol, CA. Fire Behavior: Moderate. Lateral spread to the west due to strong east winds, The fire has crossed Hopkins Creek to the North, (and burned onto the SRF Orleans R.D. Terrain: High difficulty. Very steep terrain and downhill line construction is making progress going in to hopkins Creek slow. The use of helicopters is keeping the fire in check. IC: Type 3 Fire, Unified Command with Kent Swartslander (Six River National Forest), and Gary Risling (Hoopa Tribe) as Joint Commanders. A team has not been committed. Ground: Numerous Type 3 Strike teams & Crews, many hotshots. Aircraft: Heavy tankers and helicoptersworked fire all day. Structure/resource threats: No houses or other improvements threatened now, and cultural Advisors are assigned to protect cultural sites. HIA-0221Mill Creek #4 IC: Approximately 685 + acres, still only 25% contained. IC: Type 3 Fire, Unified Command with USFS and HIA. Tom Annand (USFS) and Greg Moon (HIA) are the IC's. Behavior/Fuels/Terrain: Very heavy fuels, diffucult access, The fire has crossed Hopkins Creek to the North, (and burned onto the SRF Orleans R.D. ).which is something no one wanted to happen. A high pressure ridge off the west coast will pass over the North Ops region on Sunday. On Monday low pressure following the ridge will begin to affect the region. Winds will increase out of the S-SW, gusting to 30-40 mph over higher terrain and wind-prone areas. Humidity will be higher and clouds will increase over the area, and by late afternoon scattered rain showers will develop in coastal areas. Rain and high elevation snow (6000 ft or higher) will spread across the entire region Monday night, and continue into early Wednesday before breaking up into scattered to isolated showers. A cool and humid SW-West flow will continue over the region through the weekend with a chance of rain each day in far NW CA. LA HABRA – A Newport Beach firefighter is suspected of being responsible for the death of a girlfriend's dog Thursday evening. The firefighter, who lives in La Habra with his girlfriend in the 300 block of Oakland Drive, is suspected of punching a 6-pound Chihuahua named Bella after it bit him. Newport Beach Fire Department Chief Steve Lewis said that a private party had notified him of the situation concerning firefighter Aaron Reed, but that no action would be taken until official word comes from La Habra police. Officer Rick Van Vleet of the La Habra Police Department, who handles animal control issues, would not identify the firefighter by name. "We've confirmed that a Chihuahua bit a young man and that apparently he struck the dog," Van Vleet said. "The dog was injured and the vet put her to sleep. It's still under investigation." At this point, Van Vleet said, it's still a dog-bite investigation, so the dog's body is being examined for rabies. After the rabies test, there will be a necropsy to determine cause of death. Sacramento - California’s forest landowners are again experiencing the impacts of wildland fires on their property. 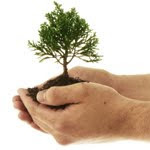 To assist those affected by wildfires, CAL FIRE has an assistance program that offers tree seedlings for reforestation. advice to landowners. Additionally, CAL FIRE has Forestry Assistant Specialists at many local Unit Offices who can also provide free reforestation advice or direct individuals to the type of professional consultant they need to assist them. These specialists also can provide information on State or Federal cost-share funding that may be available. timberland conifer species. Additionally a few hardwoods and non-native species are grown for specific landowner objectives. All seedlings grown are from seed that is well adapted to the various climate zones, growing conditions and elevations found within the state. The seedlings are grown at the Magalia Reforestation Center east of Chico. The 2009-2010 order form and price list will be available on line or by request after October 15, 2009. Road, Magalia, 95954, Phone: (530) 872-6301, email: cdfnursery@fire.ca.gov. A light earthquake occurred at 11:06:34 AM (PDT) on Tuesday, October 6, 2009. The magnitude 4.1 event occurred 8 km (5 miles) SSE of Keeler, CA. The hypocentral depth is 0.2 km (0.1 miles). A prescribed burn on Fort Ord today was curtailed after less than two hours. An Army information line said the burn in Burn Unit 14 started at 9:45 a.m.
A compliance officer with the Monterey Bay Regional Air Pollution Control District said the Army decided to shut the burn down about 11:15 a.m. "It is now in suppression mode," said Teresa Sewell of the air district. There were unconfirmed reports that a shift in wind direction prompted the move to tamp down the burn. The fires are used to clear brush in areas on the former base where there may be unexploded ordnance. Sewell said the air district hadn't received any complaints about this morning's burn. Friends say Bobby Wright is relying on faith to get him through his loss. He doesn't have much else left. The U.S. Forest Service employee lost his home Saturday during the Sheep Fire northwest of Lytle Creek. The 20 dogs he had rescued died in their kennels as the flames roared up Lone Pine Canyon. Less than a month ago, he was attacked and beaten while writing a parking citation in the course of his duties. Six years ago, he lost his previous home in the Grand Prix Fire. That time, he was able to rescue the dogs before it was too late. Wright, 63, had been living in a mobile home east of Lytle Creek for about two years. The property is at the end of Swarthout Canyon, a winding dirt road in High Desert terrain. He had been helping with evacuations Saturday as the fire rampaged through thick brush toward his mobile home, his dog kennels and his co-worker's horse stable. Wright tried to get home to rescue the animals, but his co-worker and friend, Forest Protection Officer Jack Kennedy, decided it was too dangerous. "I was tempted to let him go back in there, but the flames were moving so fast, we both would have been killed," Kennedy said. "The flames were swirling like a tornado and sounded like a railroad." A helicopter was able to douse Kennedy's barn, sparing the horse, but Wright's dogs couldn't be saved. "This was the second time he lost everything he owns," Kennedy said. Kennedy, who lives in Wrightwood, offered him a place to stay Saturday night, but Sunday the town was evacuated. Wright returned to the charred rubble of his property Sunday to bury his dogs. He could not be reached for comment Sunday. Six years ago, Wright was living in the Middle Fork area of Lytle Creek when the Grand Prix Fire swept through and left his home in ruins. Kennedy said Wright then lived in a church until two years ago. After losing his Lytle Creek home, Wright got a job as a Forest Service recreation technician, patrolling forest land and checking for violations, Kennedy said. On Aug. 31, Wright was writing a $5 citation for illegal parking at Applewhite Campground near Lytle Creek when he was hit from behind, kicked and beaten. He didn't realize he had been mugged until he arrived at the hospital, Kennedy said. One man has been arrested in the attack, and warrants have been issued for two others. As a seasonal employee, Wright had been scheduled to be laid off in the coming weeks, but the Forest Service has guaranteed he will have a year-round job. "He doesn't know what to do. He has nowhere to go," Kennedy said. "Right now he's holding on to his faith." Forest Service employees are taking donations to assist Wright in recovering from the fire. Contributions may be made to the Lytle Creek Ranger Station, 1209 Lytle Creek Road, Lytle Creek, CA 92358. For more information, call 909-382-2851. In honor of State & National Fallen Fire Fighter Memorials today. Fallen Firefighters Memorial. The names of 19 firefighters who died in previous years will also be added. CA-BDF- Sheep 7,128 acres and is 90% contaned. Road Closures: The evacuation of Wrightwood was lifted at 1200hrs today. Highway 2 to Wrightwood was reopened at 1200hrs today. Update: 10-09-09 0800hrs - Sheep Fire: CA-BDF- Sheep 7,128 acres & 90% cont. Aggressive mop-up & fire suppression repair resulted large demobilization of resources. Update: 10-08-09 0800hrs - Sheep CA BDF- 13278 SOCAL CIIMT Team #2 (Woychak) remains in command of the incident. Incident remains 7,128 acres and is 85 percent contained. Minimal fire activity and freezing temperatures were observed in the last operations period. The fire continues to smoldering in debris with some creeping. A"sheep fire" closure document has been approved limiting travel through and around the San Bernardino NF. The following road closures are in effect per San Bernardino national forest sheep fire closure area document and are listed as follows; Lytle creek road 3n06 is open up to end of pavement. Closure area begins at the south end of sheep canyon, then continues northwest to Mormon rocks, then continues west to circle mountain, then continues south to gobbler’s knob, then back to the starting point. 882 firefighters remain assigned. Included in closure is Forest rd 3no6, from the unpaved portion at the Lytle Creek shooting area, then west to its termination. Forest service rd 3n35. Pct from interstate 15 to San Bernardino national forest western boundary. These roads are closed except for owners or lessees of land within the area, permitted individuals, and any federal, state, or local officer, or member of an organized rescue or firefighting force in the performance of an official duty. Update: 10-06-09 1800hrs -Sheep CA-BDF-13278 Incident is 7,128 acres and is 75% contained. Minimal fire activity was observed today, with isolated torching of interior islands, creeping fire & smoldering. The incident has been taken out of Unified Command. The projected containment date has been moved to 10/10/09 due to access and terrain difficulties. There were four minor injuries reported this operational period. Continuing extensive mop-up of numerous heat sources. Total personnel assigned is 1,890. Update: 10-06-09 0800hrs - Sheep CA-BDF-13278 Incident is 7,128 acres and is 32% contained. Due to favorable weather conditions, minimal fire activity was observed last night. The evacuation of the community of Wrightwood is still in progress. Lone Pine Canyon Road and Highway 2 remain closed. As of 1900 hrs last night, Highway 138 was opened to the public. Lytle Creek was opened to residents only. Road closures include Lone Pine Canyon Rd, Swarthout Canyon, and Highway 2. Evacuation centers include San Bernardino County Fair Grounds and Eisenhower High School. The Damage Inspection Team has completed its final report. Acreage change is due to more accurate mapping. Total personnel assigned is 1,947. Update: 10-05-09 1800hrs - Sheep CA-BDF-13278 Incident is 7,824 acres and 30% contained. Due to favorable weather conditions, minimal fire activity was observed today. The fire was mainly a creeping fire and smoldering. The evacuation of the community of Wrightwood is still in progress. Road closures include Lone Pine Canyon Rd, Swarthout Canyon, and Highway 2. Lone Pine Cyn Rd and Highway 2 remain closed. As of 1900 hrs today, Highway 138 was opened to the public. Lytle Creek was opened to residents only. Unified Command continues with SOCAL IMT 2, San Bernardino County Fire Department and San Bernardino Sheriff. ICP is at Glen Helen Regional Park. A Damage Inspection Team is currently working on the incident. There were two minor injuries reported today. (1- minor burn & 1- minor hand injury) . Total personnel assigned is 1,715. Evacuation centers include San Bernardino County Fair Grounds and Eisenhower High School. Large animals are being accommodated at the Victorville Fairgrounds and Small animals are being taken to Devore Animal Control. Update: 10-05-09 0800hrs - Sheep CA-BDF-13278 Incident is 7,500 acres and 20% contained. Extreme fire behavior with rapid rates of spread were observed during the night operations.. Firefighters are cautiously optimistic at this time about keeping the fire from burning into Wrightwood, in addition to the West Cajon Valley between I15 and Hwy 2. Crews are constructing direct fire line and numerous engine strike teams are in place for structure protection for the eastern portions of Wrightwood. A community meeting was held last night for residents to learn more about the fire at the Lytle Creek Community Center. Another community meeting was also held at 8:00 PM at the Victorville Fairgrounds. Current Weather Temp 35 degrees Humidity: 70% Wind NE with peak gusts of 6 MPH . Forecasted weather is temp. 56 degrees, humidity 18, wind speed of 10 with gusts to 20 from the SW. Total personnel assigned is 1,296. Update: 0930hrs - Full evacuation of Wrightwood has been ordered. Scanner transcription, "We've just been advised that we will be doing a full evacuation of the community of Wrightwood. Team 7 Everything East of Oak Street; Oak Street will be your western edge; everything south of Highway 2, east of Oak Street; Team 8 Division B going to have everything East of L street all the way over to Oak Street." Update: 0900hrs - All of Wrightwood is under mandatory evacuations. Aircraft still grounded due to winds, Fire is un-contained. Update: 0800hrs - 3,500 acres, 3 homes destroyed, Highway 138 and Highway 2 closed, 1 FF heat related injury yesterday. Update: 0700hrs - Structure protection is on White 3 154.295., 55 engines enroute Code 3 to I-15 and 138 at the ICP. Update: 0530 hrs - Fire is approximately 3500 acres @10% contained. Fire is buring is a mix of timber and chaparral. Fire is currently moving north to northwest from Swarthout Canyon to Highway 138. Update: 1600+acres SoCal Team 2 (Woychak) has been activated for the fire. Update: 10-5-09 0400hrs - Fire has exploded. - Fire has hit the trigger point for Wrightwood. Mandatory evacuations have been ordered and reverse 911 is in progress. Update: : Structures reported threatened in Lytle Creek with approximately 100 residents being asked to evacuate. Initial Sizeup: Medium brush with a potential for 4000 acres - Swarthout Canyon Lytle creek area San Bernardino County. Resources: 34 handcrews, 125 engines, 4 dozers, 9 water tenders. Air: Aircraft - on deck this morning, 6 helicopters and 11 airtankers (including the DC-10 and the Martin Mars). Earthquake - 4.7 M - 6 miles S of Keeler, CA. A light earthquake occurred at 10:31:57 PM (PDT) on Friday, October 2, 2009. The magnitude 4.7 event occurred 10 km (6 miles) S of Keeler, CA. A minor earthquake occurred at 4:50:18 AM (PDT) on Friday, October 2, 2009. The magnitude 3.0 event occurred 10 km (6 miles) E of San Simeon, CA.